This last week at our little Charlotte Mason co-op, we started some fun things. First, we started a new Shakespeare play: The Tempest. I'm looking forward to this one! I like them all, but this is a great story. I think it will be less. . . disturbing than Macbeth. Ha! I told the girls we might need to make our own stop-motion video. I see peg people being involved. They were less excited by this idea than I was. I don't get it. We're using this video on YouTube to learn it. It's not a professional recording, but the congregation sings really well and you can hear all the parts being sung! I'll sing you twelve, O, green grow the rushes, O! Some of the references seem obvious to me. Others of them seem rather strange. I did an internet search, and didn't come up with much definitive information. For example, I found lyrics that said "Eight for the April rainers," which, according to Wikipedia, could refer to the "Hyades star clust, called the 'rainy Hyades' in classica times and rising with the sun in April.' " However, in the video below, they say "April raiders," and that made sense to me, too, because I've read that people used to watch for raiders to visit their shores when the weather improved in the spring. If you know where I might find out more information on the song, I'd love to know! I've checked in my folk song books, but it's not in any of them. I found this video on YouTube of two gentlemen who seem to be bards performing it with motions and everything. (If you're interested in the bards, check out this website. There are some great songs.) It's a great deal of fun to watch. I'm hoping to convince the kids to learn the motions and perform it at the end of the year. I love sharing our music with you. It's probably my favorite part of co-op. And, one more thing, just for fun. We worked on our dry brush skills last week, and we each made a "splotch book" in our nature journals by blending colors and seeing what effects we created. You can read a bit about that, and see a picture of a splotch book, here. 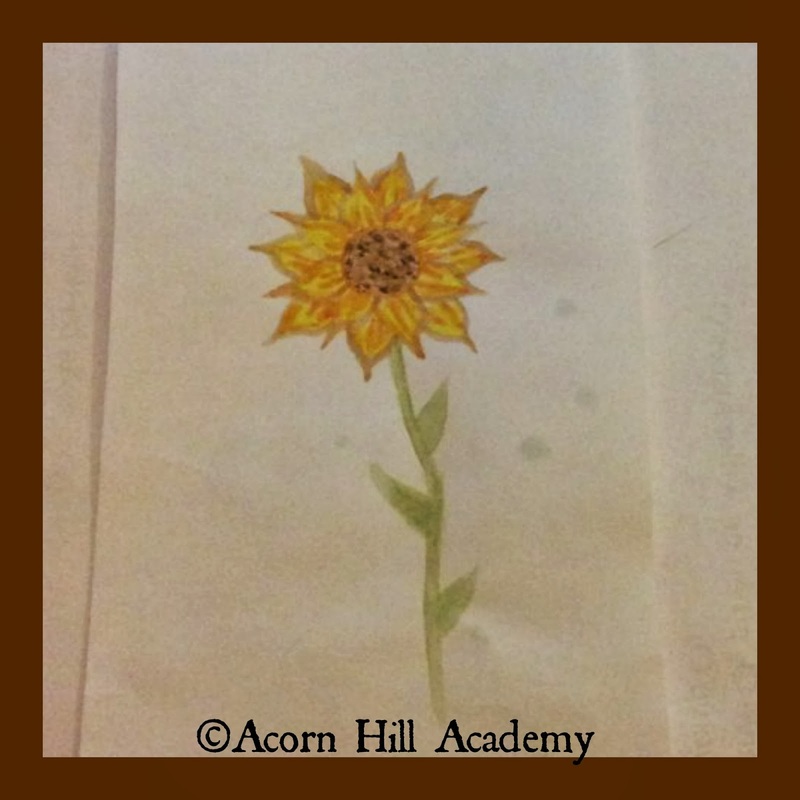 My middle child, Abbie, painted this lovely sunflower for me this morning using dry brush. I'm going to make it into a bookmark. We sing "My Anchor Holds" a lot at my church. Love it!